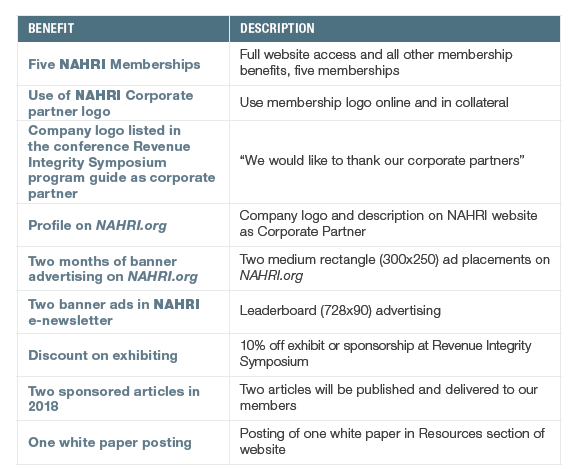 NAHRI sponsorship and marketing programs give you direct access to revenue integrity decision-makers and influencers. The introductory Corporate Partner Program is limited to four companies. This program aligns you with NAHRI and puts you front and center with branding, access to membership, distribution of your content to our audience, advertising and more. Other opportunities are available, including participation in the Revenue Integrity Symposium. For more information, please contact Carrie Dry at cdry@hcpro.com, or call 630-235-2745.